The fan experience at the ACC Digital Network (ACCDN) just ramped up thanks to the recent launch of the “Guest Reporter Search” campaign going on right now via the Internet, where one lucky reporter will be selected to be part of the media crew at the 2014 Dr Pepper ACC Football Championship in Charlotte, NC on Saturday, December 6. Our thanks go to Natalie Jenkins, ACCDN Director Marketing, for sharing this sports technology inspired contest with the Sports Techie community blog readers and followers. I would like that winner to be a #SportsTechie so here is how you enter – be a current ACC college student or proud alumni and you have earned the special chance to win between the dates: August 25, 2014, and the deadline for entry: October 31, 2014. The ACCDN and theACC.com is the digital hub for ACC university students and alum to participate in the search for people who want to break into the sports business Industry, or perhaps you have the required burning desire to represent as a true fan right besides host Jeff Fischel inside the stadium studio. This unique guest reporter contest calls for a preferred journalism or communications degree, but experience is not required to win. The fact is, the ACCDN is on the look for talented writers, social media experts and reporters of any age, that have what it takes in terms of loyalty to the ACC and their favorite school, plus a deep rooted spirit for college football, to win. Entry is easy and tailor made for a Sports Techie. Use your mobile device or computer to log onto the theACC.com/GuestReporter website page and download an entertaining 1:00 minute video or a mind-blowing 500 word article that features a trendy or compelling ACC Sports storyline, and then fill out and submit the entry form. After your submission is approved by judges, the responsibility is on you, the contestant, during the initial judging period, to engage as a sports reporter and prove your skills with Twitter handle, @theACCDN. Also, use the ACCDN sports videos highlighting your favorite team as tweet content. In order to win you must have a memorable personality, one-of-a-kind creativity and the skill sets to promote ACCDN videos, pictures and text of your favorite ACC institution. Several contestants could be selected to participate via a guest ACCDN video segment or else be invited to upload your article as a feature on theACC.com. 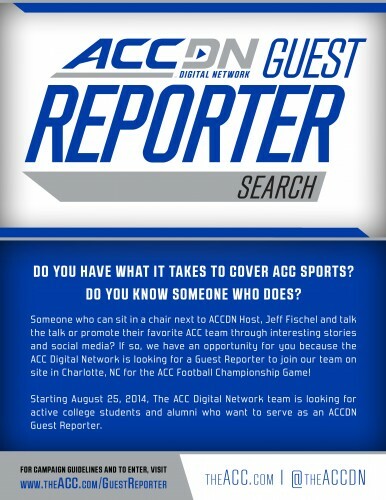 All global fans can be part of the ACC Digital Network Guest Reporter Campaign by supporting the contestants activity you wish to win that will be highlighted on twitter and Instagram at @theACCDN. For complete details and campaign guidelines, visit theACC.com/GuestReporter. Remember, the deadline to enter is October 31, 2014. For more information and official rules, click here. All ACCDN videos are viewable on theACC.com, the ACC mobile and tablet app, as well as various streaming and connected mobile and TV devices such as Amazon Fire, Apple TV and Roku. Sports Techie, The sportsbiz world is one of paying your dues, connecting with like-minded professionals and creating your own breaks, as well as getting lucky from time-to-time. If you love the NCAA and ACC sports, its time to take advantage of this sports tech program and get your smartphones, tablets and action cams out in order to film the winning video, or use a popular article written by you, as leverage to help win the ACCDN and theACC.com “Guest Reporter Search” that spans these next two months. I did not attend an ACC college but I hope you did. If you have the moxie to enter, let us know as a blog comment or at any of our social media links below so we can support your road trip to the ACC Championship stadium field in Charlotte. Good luck!